I got this book for free in exchange for an honest review. Somebody on the behalf of the author contacted me through my book reviewing blog asking me to review this book. First of all I would like to say a big thank you to Hassan El-Tayyab for sending me this book and giving me a chance to read it. I also want to say a big thank you to Serena Agusto-Cox who contacted me and thank you for taking the time to email me. Front and back cover art by Alice Guo. Cover design by Melody Shirazi and John Peterson. Photos in the book that were turned in to sketches by Hassan El-Tayyab and Gretjen Helene. Transcription of temple sunrise by Colin Sapp. Back cover photo by Amal Dar Aziz. Edited by Faith Adiele, Marisa Belger, David Colin Carr, and Kayli De Saussure. Arabic Translation Assistance by Devon Peterson. Dedication: To all the amazing people I have met, and continue to meet on this journey. This book has 224 pages and 32 chapters in it. I normally do not read books of this genre but l stepped outside my comfort zone with authors and genres I am so glad I did because I have read so many great book and come across some great authors. All growth is a leap in the dark, a spontaneous unpremeditated act without benefit of experience. - Henry Miller. As you navigate through the rest of your life, be open to collaboration. Other people and other people's ideas are often better than your own. Find a group of people who challenge and inspire you, spend a lot of time with them, and it will change your life. - Amy Poehler. I think it is in collaboration that the nature of art is revealed. - Steve Lacy. All that we see or seem, is but a dream within a dream. - Edgar Allen Poe. Faith is taking the first step even through you do not see the whole staircase. - Martin Luther King Jr.
when one door closes another door opens: But we so often look so long and so regretfully upon the closed door, that we do not see the one's which open for us. - Alexander Graham Bell. He who is not busy being born is busy dying. - Bob Dylan. When written in Chinese the word 'crisis' is composed of two characters one represents danger, and the other represents opportunity. - John Fitzgerald Kennedy. Sometimes you have to play for a long time to be able to play like yourself. - Miles Davis. A goal is not always meant to be reached, it often serves simply as something to aim at. - Bruce Lee. Home is where one starts from. - Ts Elliot. My great concern is not whether you failed, but whether you are content with your failure. - Abraham Lincoln. He is not a lover who does not love forever. - Euripides. As we look ahead in to the next century, leaders will be those who empower others. - Bill Gates. Every artist was first an amateur. - Ralph Waldo Emerson. A poem begins as a lump in the throat, a sense of wrong, a homesickness, a lovesickness. - Robert Frost. A house is not a home unless it contains food for the mind as well as the body. - Ben Franklin. Every dream begins with a dreamer. - Harriet Tubman. Music happens to be an art form that transcends language. - Herbie Hancock. To walk safely through the maze of human life, one needs the light of wisdom and the guidance of virtue. - Buddha. A good artist should be isolated, if he is not isolated, something is wrong. - Orson Wells. It is not the strongest species that survives, nor the most intelligent who survives it is the one that is the most adaptable to change. - Charles Darwin. The world as we have created it is a process of our thinking. It can not be changed without our thinking. - Albert Einstein. The word enlightment conjures up the idea of some superhuman accomplishment, and the ego likes to keep it that way, but it is simply your natural state of felt oneness with being. - Eckhart Tolle. If any human being is to reach full maturity both the masculine and feminine sides of their personality must be brought up in to consciousness. - Mary Esther Harding. Tell me and l forget, teach me and l may remember, involve me and l learn. - Benjamin Franklin. Et Tu, Brute. - Julius Caesar. Old friends pass away, new friends appear. It is just like the days. An old day passes, a new day arrives. The important thing is to make it meaningful. A meaningful friend – or a meaningful. - Dalai Lama. Travel is fatal to prejudice, bigotry, and narrow-mindness. - Mark Twain. It seems no work of man's creative hand, by labour wrought as wavering fancy planned, but from the rock as if by magic grown, eternal, silent, beautiful, alone!. Not virgin-white like that old Doric shrine, where erst Athena held her rites divine, not saintly-grey, like many a minster fane, that crowns the hill and consecrates the plain, but rose-red as if the blush of dawn, that first beheld them were not yet withdrawn, the hues of youth upon a brow of woe, which man deemed old two thousand years ago, match me such marvel save in eastern clime, a rose-red city half as old as time. - Johann Ludwig Burckhardt. Through forgiveness, which essentially means recognizing the insubstantiality of the past and allowing the present moment to be as it is, the miracle of transformation happens not only within but also without. - Eckhart Tolle. Just as a candle can not burn without fire, men can not live without a spiritual life. - Buddha. The grand show is eternal. It is always sunrise somewhere, the dew is never dried all at once, a shower is forever falling, vapor is ever rising. Eternal sunrise, eternal dawn and gloaming, on sea and continents and islands, each in it's turn, as the round earth rolls. - John Muir. What is commonly called “falling in love” is in most cases an intensification of egoic wanting and needing. You become addicted to another person, or father to your image of that person. It has nothing to do with true love, which contains no wanting whatsoever. - Eckhart Tolle. Where there is love there is life. - Mahatma Gandhi. 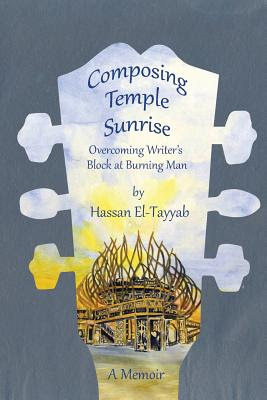 Synopsis: This is a memoir by musician Hassan El-Tayyab and recounts his trip across the US looking for that elusive muse. He arrives in Berkeley and hooks up with a group creating a metal sculpture called FishBug. They go to burning man in the Nevada dessert and here he writes the musicial piece temple sunrise. Hassan is a musician singer/songwriter with his group American Nomad. This is a book of travel, personal exploration, community, and that elusive finding of the creative source. A beautiful song comes of this journey as well as a beautiful, insightful book. in this candid, inspiring memoir, singer/songwriter Hassan El-Tayyab of American Nomad takes us deep in to the heart of what it means to chase a creative dream. After experiencing multiple losses (family, home, love, job, self-confidence), El-Tayyab sets out on a transcontinental quest that eventually lands him in Nevada's black rock dessert, his vivid descriptions, paired with artist's renderings, capture both the vast, surreal landscapes of the burning man festival and the hard practice of art-making. Composing temple sunrise is both a page-turning adventure and a road map for anyone struggling to forge their way. - Faith Adiele: an inward odyssey: editor of coming of age around the world: a multicultural anthology. Going to burning man for the first time can be a powerful, life-changing experience. That is particularly true when someone is involved with building a major art installation, and even more so when that person is wrestling with personal demons and searching for a new life path, and so it was in 2009 when struggling teacher-turned-musician Hassan El-Tayyab found himself in a strange warehouse in a new city, buzzing with preparations to bring FishBug to the playa in a few weeks. - Steven T. Jones, author of the tribes of the burning man: how an experimental city in the dessert is shaping the new American counter culture. Review: I found this book really easy to get in to and hard to put down once l started reading it. I was hooked after reading the first page. I really enjoyed reading this book I was sad to finish this book. I loved reading about building the FishBug and the team who built it. I was sad to read that Rebecca's brother committed suicide. I loved reading about burning man and all the people that met each other there. I was sad to read that Hassan's father lost his eye when he was young and he left home and dropped out of school to go to Germany to get his eye sorted out because he thought the doctors was better there Hassan's father now has a glass eye. It was to read that Hassan's parents split up and then they lost their home when his grandparents passed away. Hassan worked as a special education teacher but he lost his job. I love the quotes in this book I was sad to read that Hassan's bike was stolen. It did not take me long to finish this book. Hassan's father slept on the streets of Germany just so he could get his eye sorted and l think he was very brave doing so. The temple that was built to burn at burning man they was load's of messages wrote on the wood so when it was set on fire all the names and messages would go up in smoke. Hassan wrote his ex-girlfriend's name so he could move on and get over his broken heart. Hassan's mother sounds so brave and Hassan sounds like he is very close to his sister Sara. I can not put in to words how great this book is l would tell people to read it for themselves to know how great it is. I am glad Hassan over come his writer's block. I was happy that Hassan wrote a song and got a band together. I am glad Hassan never committed suicide. As his family and friends would miss him. I would love to read more about Hassan, his family and friends. Hassan sounds like a great guy. I could not get enough of this book. I love reading memoir. I loved reading about Hassan, his life and his family and friends. I wish this book would finish. I would love to read more books from Hassan El-Tayyab. I got this book in paperback. I am glad I read this book and glad it is on my bookshelf. I would happily read this book again. I love reading books about other people's life. When l was reading this book I would chill out on my bed listening to magic. I fell in love with this book and it took me away I easily got lost in this book. I loved that Hassan made lots of friends after he put a ad on Craigslist looking for someone to drive cross country with him so they could take turns at driving and share the prices of petrol and then he met the FishBug crew and helped them build the FishBug and their become friends. The pictures in this book was drawn by Hassan and his Gretjen I think they both are really good at drawing. My sister is currently reading this book as I am writing up my review. This book is a must read. About The Book: I really love this book cover and the pictures and the colours on this book cover. Thanks so much for being on the blog tour. I'm so glad that this book resonated with you.